Apologies for the delay in updates, I had expected to be back to updating early last week but had a lot of serious personal things come up (an accident, death, and funeral). I know the schedule has probably tested yalls patience, I feel you very much on that. Am hoping to be back to normal for the rest of this month, if the powers that be are willing. I’m surprised to see such an attitude change in Mike. His sympathy for others must override his other emotions. “Yes, it is very yikes” succinctly sums up everyone’s situation in this comic, really. At least there’s no where but up from here! I mean literally, there’s probably going to be a lot of climbing involved. The toaster is taking over his face. It’s been over his eye since about page 21 of this chapter. Or are you talking about his remaining eye? Pretty sure he’s just surprised. The remaining one, of course. Der-shing usually reserves giant anime eyes for The Meek and it’s surprising to see such a big eye in MI for me. I think he’s being pop-eyed in surprise. An accident, a death, and a funeral – yikes. You have nothing to apologize for. Mike has a human settlement up there. under tons of rubbles, and if he manages to ontact them, and if they think it’s worth risking the life of more people to go save him. Maybe. The alien ? Pretty sure there’s no survival outside this biome. KK isn’t an alien. She is a native. We are the aliens on Mars. KK should go with Mike and the humans. We are his closest living relatives, besides the local fungi and the shoulder pet of Mike’s. Mmh, I don’t know, Mike. After all, she’s stayed there for… what, *billions* of years? It’s pretty natural she gave up. With a brain wipe every now and then. Well, not a wipe, a “factory reset”. Subterranianness is only a 1 or a 2 on a 1-10 scale of horrors. Toasterface is maybe only a +1 modifier, honestly, unless he continues to be colonized. Wait, is… Is Mike about to give Kallakore a motivational speech? I feel like Mike is one of those people that needs to other people to be weak in order to be strong himself. I don’t mean like a bully, but rather like a leader who only steps up when everyone else has been beaten down. Now that Kal has been….hmmmm “humanized”? to him and opened up about be scared and lonely, Mike seems to have regained his focus. Also, Mike was suicidal until he fell down there. Now he is fighting to survive and get back. Kallakore, you’re talking to an Astronaut. They’ve never been known to accept the limitations of their environment. 2/5 of those have been names of ships we’ve sent up. So human. The “bio-cybernetic” filter-shrooms growing on Mike seems to function more and more like the structure gel in SOMA the more I think about. But what did it find that was so “attractive” about Mike like Kallakore suggested? Is it that it recognizes genetic similarities between Mike and Kallakore but identifies the differences of Mike’s physiology as an illness and is therefor trying to sustain his life? I remember Kallakore hinting that Humans might have evolved from martian waste microbes. But again it was only Kallakores guess. Is the biotech growing on Mike supposed to substantiate this? Amazing story though. This idea made me comment for the first time. If the zeitgeist is right, and “she” is actually biologically shark-like, then… Speaking as a biologist, shark-skin is nanostructured in ways that avoid colonization, and sharks have an intrinsic immune system that leaves them immune to cancer and most pathogens – and recent studies show that sharks can live for over 400 years – in spite of the harsh environment. Maybe it’s literally just her rough skin that keeps her from being colonized? Given the latest news about Greenland sharks being old as balls, Kalla’s own possible lifespan doesn’t seem so far-fetched now. Still, I don’t think 350 years is on par with billions of years. Something fucky is definitely going on to sustain Kallakore’s existence. My money is on backup-and-restore like Eclipse Phase’s transhumans do. Perhaps it will be possible to interface with the ocean’s processors to extract this technology? 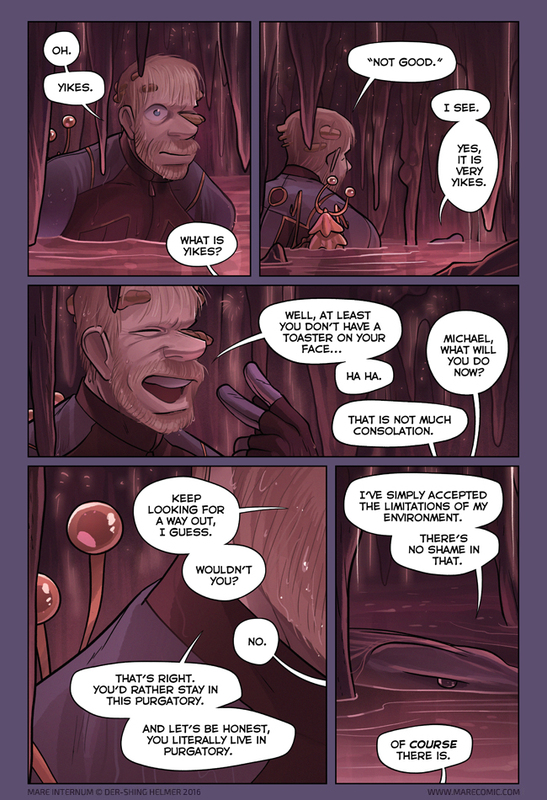 Then imagine a sequel comic where Kallakore is cloned into a human body for debriefing? This would be better than … all of this season’s anime, to be entirely honest. I’d also enjoy reading about her adjustment to terragen society. The “Android’s Journey” is an old favorite of mine. I’m sorry about the death in your family/circle of friends. Thrip is totally the eyes-and-ears of the CPU.